Someday, when it’s grown up, Sahara would like to be Raiders of the Lost Ark. Matthew McConaughey produces and stars in this action-comedy directed by Breck Eisner (son of lame-duck Disney chief Michael Eisner). 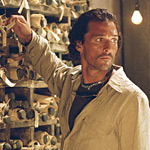 He plays Dirk Pitt, with whom Clive Cussler’s readers will be familiar. Even for those of us who haven’t read the novels, the name Dirk Pitt conjures images of amazing heroics, damsels in distress, and exotic locales, which is exactly what Sahara delivers. With the protagonist (McConaughey), the sidekick (Steve Zahn, stealing the show), and the girl (Penelope Cruz, lovely as ever) all introduced and firmly in place, the plot kicks off in Nigeria. Dirk wants to sail up the Niger in his boss’ boat to pursue a pet theory of his: that a Civil War ironclad sailed across the Atlantic, steamed up the Niger, and sank somewhere in Africa. The girl, Dr. Eva Rojas, hitches a ride with college-educated Dirk and his blue-collar sidekick Al. She wants to travel up the river to find the source of a new, disturbing disease, and hopefully stop it from spreading. Serving as villains are the nameless paramilitary types who open fire on Dirk’s boat without explaining why. There is also a vaguely German businessman who you just know has to be evil, but you don’t quite know how at first. Sahara’s four screenwriters find excuses for all sorts of adventure, including boat chases, gunfights, and stunts galore. They also manage to tip the hat to a whole multiplex of movies, from Raiders to James Bond to Star Wars — there’s even a contrived, unnecessary train scene that seems to exist solely as a salute Lawrence of Arabia. There are two ways to view Sahara. The best way is to not take it too seriously and just enjoy the ride. But it’s impossible not to notice the other perspective, which is that Sahara is a derivative, generic action movie driven more by the autopilot than the characters or the plot. So what makes Raiders a noble homage and Sahara a mere copy? That’s a fair question for which I don’t have a good answer, except to say that Raiders became a serial adventure; it didn’t merely copy the genre piecemeal. Raiders was relentless, surprising, and completely over the top. Perhaps I can’t explain exactly why it was so good, but then neither can the people behind Sahara. Sahara is the kind of movie my harshest critics (R. and J., you know who you are) usually disagree with me on. Although I enjoyed the movie, I can’t get past some of the details that just didn’t work, like the gratuitous classic rock soundtrack, or the silly cave-painting prophecy, or the hackneyed corporate villain and the save-the-earth call to arms. But J. and R. will probably be thoroughly entertained, ignoring my complaints as too vague, too subjective, or just plain wrong. So I’ll cede a half-recommendation for Sahara, especially to R. and J., and I’ll even admit that it was kind of fun to watch, even if I was ultimately unimpressed. Kat: Could you please tell me the makers of the boat named Calliope in the movie Sahara. Ray: The boat was made by halmatic mfg co but was VERY VERY ( new engiens, jet drive, eequipment, furniture, etc.) heavally modafied by Breck Eisnier and the prop department in this movie. everything you see in the movie was added/modafied and tthee actuall boat was white. But if you were planning don't dispare one of the three boats they used to shoot the movie is still for sale in the UK. I hope this answers your question. What is the boat company name? Tim: SAHARA was a lighthearted fun romp and a great way to be entertained for a couple of hours ... with fun music and lots of adventure ... requiring, as they all do, a certain suspension of disbelief. Has it been done before? Yes. Hasn't everything? Much like Cussler's books ... its a lazy Saturday afternoon read, not a biography or something educational or inspirational. Its not intended to be. Relax and enjoy the fun little romp that this movie provides ... complete with cheesy-yet-entertaining and enjoyably appropriate rock soundtrack and playful banter between the two main characters. Merlyn: The above post is correct.